Instead of doing stats today (sorry Vepar!) I thought I'd discuss some of the issues with research. When doing research for this blogfest and for my game books in general the first thing you notice is that the myths of the world do not organize themselves in nice logical units. This could not be more pronounced when trying to figure out what the difference is sometimes between a Vampire and a Demon. Game books and novels that feature both often make pretty clear lines. This is a vampire and they do X, Y and Z. This is a demon and they do A, B, and C and sometimes D. But go to the myths of the world and then you find creatures that do X, A, B and D but never C, Y or Z. When getting ready for this I was also researching various vampires. This was almost an A to Z of Vampires (maybe next year). what some cultures call a vampire another call a ghost and another a witch and another a demon. Sometimes with the same names. A lot of creatures from China, Japan and the Philippines are like this. The Succubus and most of what I call the Lilim are a great examples. While they are classified as demons they have a lot of vampire like qualities. In some games a "Succubus" is even just another type of Vampire (World of Darkness and WitchCraft). Yet in others a Vampire is a type of demon (Buffy the Vampire Slayer). Even is games where the distinctions are really, really clear there can still be a lot of overlap. The succubus is one good example, but so are the Nabassu. Nabassu, also known as Death-Stealers, are described as demons that are close to undead. They even look like the true form of the vampires from Lifeforce and the Red Court Vampires from the Dresden Files. Looking at them it is hard to tell which one is the vampire and which one is the demon. 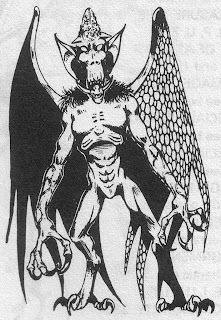 So the issue for writers putting mythological creatures in their books (novels, stories, games) and that is what sort of creature is this? Have a look at the Mayan god Camazotz. His name is roughly translated as "Death Bat". In a book he could be a god, a demon or a very powerful vampire. Lilith is another great example. Is she a demon, witch, vampire or just a human. Of even the Baohban Sith, is she a faerie or a vampire. Of course the one other option is "All the Above". Creatures that blur the lines a little are nice to have. Hey Tim! Did you hear from House of Fun yet about a possible Morrigan figure? I did! They will be shipping it to me soon. I was going to post when I got her. 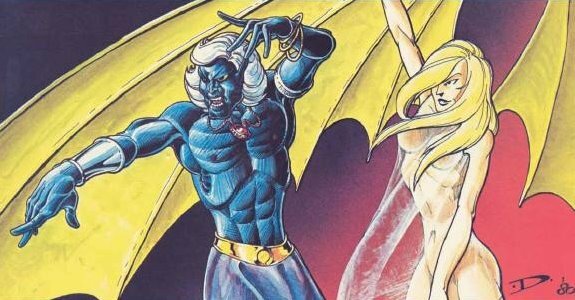 So I have to wonder, are succubi considered vampires because they feed off of life force? What does the traditional mythology consider them? Awesome! If you don't mind me asking, how much did you pay for the figure? I'm assuming it was way below the high prices you were finding during your earlier searches? very interesting turn on your post... i am glad you were able to find your figurine. Vampirology is an interesting subject and can get pretty tangled up when crossing cultural lines. +Samuel Bledsoe: Depends on the myth at hand. I think it is due primarily to their draining and their appearance. Anthony: Something like $45 + shipping. So a great deal to be honest! All: Yeah the research has been a blast! You are only seeing a part of the final products of it all. That's a great way to create new monsters - blend two together. That is so true, and the farther you go back in history, the more the lines between the creatures start to blur. You can throw werewolves in that lot as well. A lot of vampires from around the world had qualities akin to werewolves. Let's not forget the vampires that sparkle. Lol. And here I thought distinctions were supposed to be clear cut. Okay, I'm going to be back, like this. I do love the old ideas of vampires. They're definitely a lot more humanised now which takes away their creepy edge in my opinion. Great post and thanks for the link! Categories only came along in the Victorian era, when everything needed to be collated, printed in a nice serif font, and attractively bound in a leather volume.